Port Quin in North Cornwall. © thisisnorthcornwall / kestrel solutions 1998-2018. 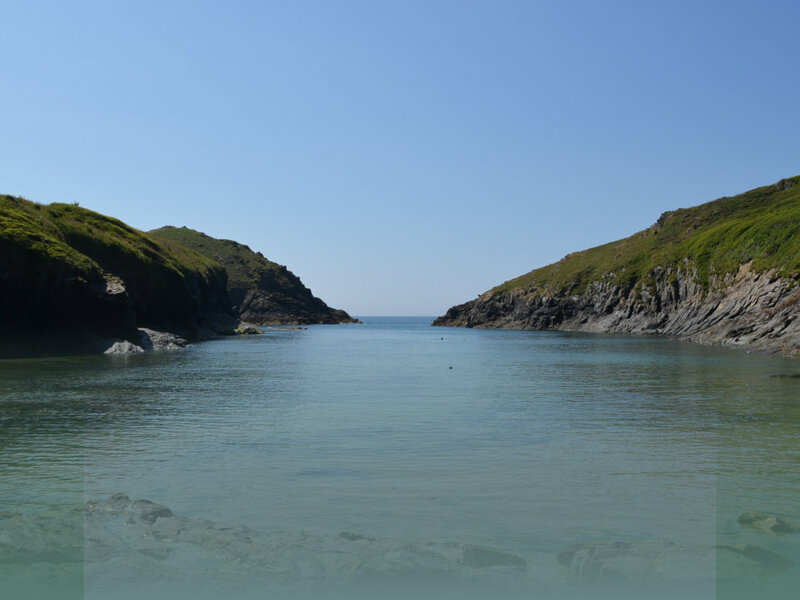 This beautiful natural harbour is situated just a couple of miles south of the busy harbour village of Port Isaac and offers safe bathing waters on calm days. The odd boat chugs in and out now and again, for a nose, but other than that the place is a tranquil cove that conjures up images from the past. There are stunning cliff walks and plenty of nooks and crannies on the beach to poke around in when the tide is low. To find Port Quin just head on past the turning for Port Isaac as if you where going to Polzeath, and look for the tower of the church at St Endellion. This tower was used as a navigation aid to ships in days gone by, but now guides sightseers towards one of the most dramatic stretches of coastline in the whole of England. Just before you reach the Church at St Endellion, you will find a narrow country lane leading down to the Longcross Victorian Gardens, here the turning for Port Quin is clearly signposted. There is a definite feeling of days gone by as you travel down this lane, following the twists around tight little bends that take you ever nearer the sea. Port Quin was abandoned on two occasions, once when the pilchards failed and once when all the men were drowned at sea, and is still sometimes referred to has the "Village that died", because late one stormy night, sometime in the19th century, the entire male population were drowned at sea whilst out fishing. The women of the village were unable to continue without their men folk, their hardship became intolerable and Port Quin was left deserted, with the fishermen's cottages falling into disrepair, ruin and the sea. You can still see the fish cellars there today. But the Port is now mainly a tourist spot with a scattering of National Trust properties and a couple of private dwellings. It is also rumoured that Viking longboats came ashore here and apparently, the remains of one that was buried, are here about. The headland on the south side of Port Quin is known as Doyden Point whereon you will find Doyden Castle, which was built in 1830 as a retreat for some local businessman, where, it is reputed the partying and gambling were quite excessive! Now it is a National Trust holiday property has is nearby Doyden House. Has recently has 12/06/05 25–30 Common dolphins were spotted off Port Quin Bay. A sign that the water is getting warmer is the appearance of the rare pink sea fan which has been recorded at the Mouls off Port Quin, which is a new, previously unrecorded site. Port Quin has been a location for the TV series Poldark (1975-77). Based on Winston Grahams Four Poldark novels, this C18th Cornish Romantic drama followed the life of Ross Poldark. More recently Amy Foster (1996)used Port Quin as a location. 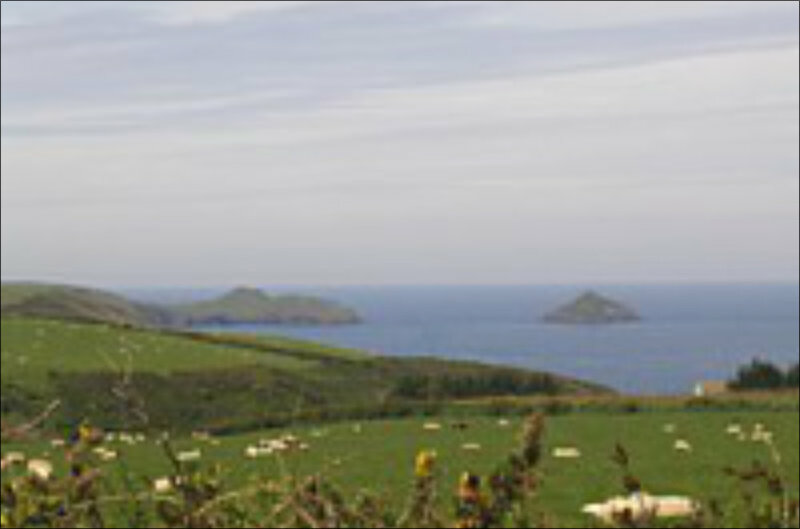 Port Quin is also one of the places that inspired Marcia Willet during the writing of her book, "The Golden Cup". Sir John Betjemen also had a special affection for this neck of the woods..... "St.Endellion! St.Endellion! The name is like a ring of bells...", First and Last Loves (1952). His last resting place can be found at St Enodoc in the dunes of Daymer. The church at St Endellion is dedicated to St Endelienta and has many legends about the saint whom gave her name to this church and parish. One suggests that she was the daughter of the Welsh King Broccan, another that she was the god-daughter of King Arthur, who helped her when a local lord killed her cow. It is the only church known to be dedicated to this saint. 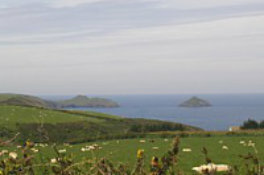 The parish is on the north coast of Cornwall south of Port Isaac. The high ground upon which the church stands renders its tower a conspicuous object at a considerable distance, and was a landmark from the sea. The organ for the Collegiate Church of St Endellion was made in 2001 and is based on early 18th century English organs, mainly the Father Smith organ at St Mary Finedon in Northamptonshire and the Gerard Smith organ at St Lawrence Whitchurch in Middlesex. If you look you will find St Endelienta's emblematic cow in the middle of the central pipe shade. The Long Cross at St Endellion or St Endellion Pillar was first mentioned in 1753 by a J Tregeare. In 1753 a James Tregeare collected notes for Borlase...He referred to a cross standing on the boundary of Roscarrock Barton, between Roscarrock and St. Endellion Church `with a barbarous inscription'...The stone was certainly recorded in 1821 as being at the junction of the roads above Roscarrock higher-town gate and thrown down and broken within these few years'. In 1873 Maclean recorded that the stone had been `removed by the late Mr. Symons of Gonvena to Doydon Head near Port Quin, on the western side of the creek'...The stone remained on Doydon Head until `the end of 1932', when it was replaced in its original position, where it still is'. The stone is a cross- marked pillar-stone, made from local granite, that appears un-carved, although a cross in relief has been noted on the back of the stone. 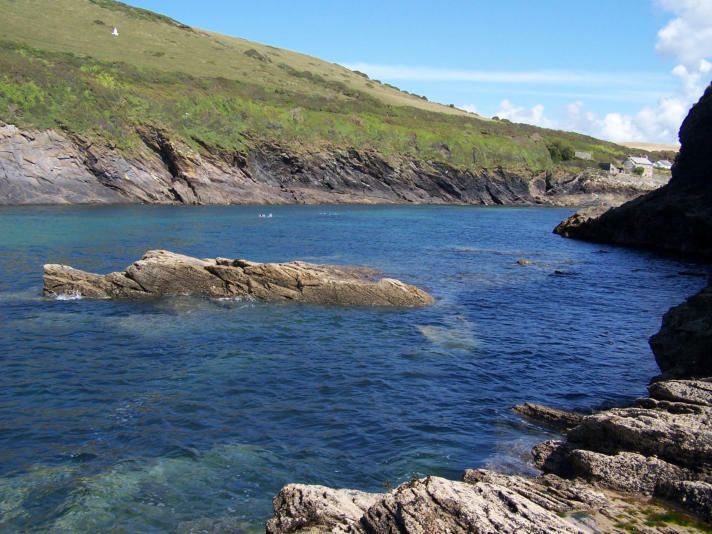 There is a national trust car park at Port Quin and Kayaking and Cliff Jumping are popular sports that are practised from this cove. On the 24th August 2010, David Cameron, the serving Prime Minister, was on holiday in North Cornwall when his wife, Samantha, went into labour at Truro's Royal Cornwall Hospital and gave birth to a healthy baby girl that they chose to name Florence Rose Endellion Cameron. The Cameron's' new baby Florence is only the third baby to be born to a serving prime minister since 1849. Whilst you are here make sure you take a look at the Victorian Gardens at Longcross. Long Cross Hotel and Restaurant are situated in a fabulous location within three acres of Victorian gardens near the coast at Port Quin and Trelights. The Longcross restaurant provides the perfect place to relax while sampling the wide choice of exciting cuisine. Whether it be a lazy lunch, a relaxing cream tea after a stroll in the gardens, or a romantic three course dinner - Longcross is the place to go. We also welcome families - the gardens are always popular with children as is our new adventure play area. Port Isaac and Port Quin Port Isaac and Port Quin self catering accommodation. 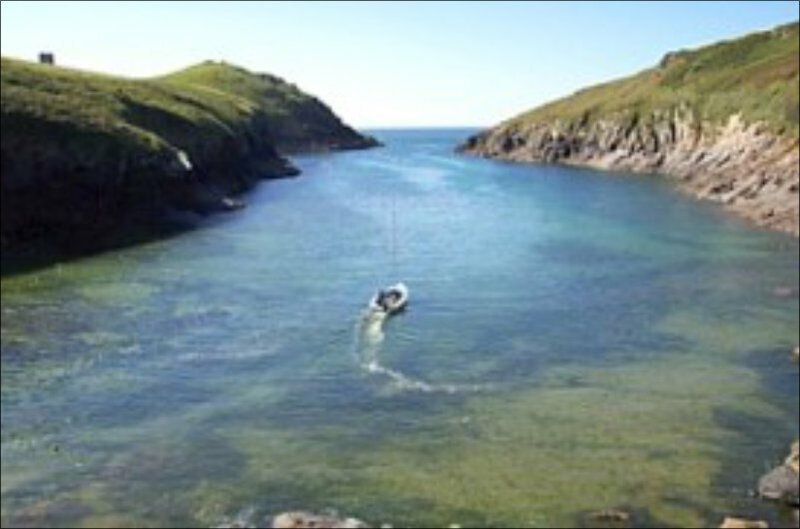 This beautiful natural harbour is situated just a couple of miles south of the busy harbour village of Port Isaac and offers safe bathing waters on calm days. The odd boat chugs in and out now and again, for a nose, but other than that the place is a tranquil cove that conjures up images from the past. There are stunning cliff walks and plenty of nooks and crannies on the beach to poke around in when the tide is low. To find Port Quin just head on past the turning for Port Isaac as if you where going to Polzeath, and look for the tower of the church at St Endellion. This tower was used as a navigation aid to ships in days gone by, but now guides sightseers towards one of the most dramatic stretches of coastline in the whole of England. Just before you reach the Church at St Endellion, you will find a narrow country lane leading down to the Longcross Victorian Gardens, here the turning for Port Quin is clearly signposted. There is a definite feeling of days gone by as you travel down this lane, following the twists around tight little bends that take you ever nearer the sea. Port Quin was abandoned on two occasions, once when the pilchards failed and once when all the men were drowned at sea, and is still sometimes referred to has the "Village that died", because late one stormy night, sometime in the19th century, the entire male population were drowned at sea whilst out fishing. The women of the village were unable to continue without their men folk, their hardship became intolerable and Port Quin was left deserted, with the fishermen's cottages falling into disrepair, ruin and the sea. You can still see the fish cellars there today. But the Port is now mainly a tourist spot with a scattering of National Trust properties and a couple of private dwellings. It is also rumoured that Viking longboats came ashore here and apparently, the remains of one that was buried, are here about. The headland on the south side of Port Quin is known as Doyden Point whereon you will find Doyden Castle, which was built in 1830 as a retreat for some local businessman, where, it is reputed the partying and gambling were quite excessive! Now it is a National Trust holiday property has is nearby Doyden House. Has recently has 12/06/05 25–30 Common dolphins were spotted off Port Quin Bay. A sign that the water is getting warmer is the appearance of the rare pink sea fan which has been recorded at the Mouls off Port Quin, which is a new, previously unrecorded site. Port Quin has been a location for the TV series Poldark (1975-77). Based on Winston Grahams Four Poldark novels, this C18th Cornish Romantic drama followed the life of Ross Poldark. More recently Amy Foster (1996)used Port Quin as a location. 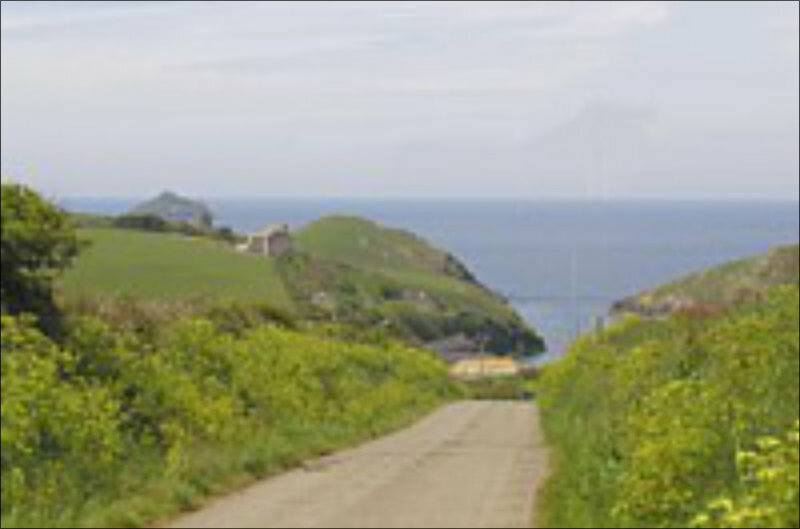 Port Quin is also one of the places that inspired Marcia Willet during the writing of her book, "The Golden Cup". Sir John Betjemen also had a special affection for this neck of the woods..... "St.Endellion! St.Endellion! The name is like a ring of bells...", First and Last Loves (1952). His last resting place can be found at St Enodoc in the dunes of Daymer. The church at St Endellion is dedicated to St Endelienta and has many legends about the saint whom gave her name to this church and parish. One suggests that she was the daughter of the Welsh King Broccan, another that she was the god-daughter of King Arthur, who helped her when a local lord killed her cow. It is the only church known to be dedicated to this saint. The parish is on the north coast of Cornwall south of Port Isaac. The high ground upon which the church stands renders its tower a conspicuous object at a considerable distance, and was a landmark from the sea. The organ for the Collegiate Church of St Endellion was made in 2001 and is based on early 18th century English organs, mainly the Father Smith organ at St Mary Finedon in Northamptonshire and the Gerard Smith organ at St Lawrence Whitchurch in Middlesex. If you look you will find St Endelienta's emblematic cow in the middle of the central pipe shade. The Long Cross at St Endellion or St Endellion Pillar was first mentioned in 1753 by a J Tregeare. In 1753 a James Tregeare collected notes for Borlase...He referred to a cross standing on the boundary of Roscarrock Barton, between Roscarrock and St. Endellion Church `with a barbarous inscription'...The stone was certainly recorded in 1821 as being at the junction of the roads above Roscarrock higher-town gate and thrown down and broken within these few years'. In 1873 Maclean recorded that the stone had been `removed by the late Mr. Symons of Gonvena to Doydon Head near Port Quin, on the western side of the creek'...The stone remained on Doydon Head until `the end of 1932', when it was replaced in its original position, where it still is'. The stone is a cross-marked pillar-stone, made from local granite, that appears un-carved, although a cross in relief has been noted on the back of the stone. There is a national trust car park at Port Quin and Kayaking and Cliff Jumping are popular sports that are practised from this cove. On the 24th August 2010, David Cameron, the serving Prime Minister, was on holiday in North Cornwall when his wife, Samantha, went into labour at Truro's Royal Cornwall Hospital and gave birth to a healthy baby girl that they chose to name Florence Rose Endellion Cameron. The Cameron's' new baby Florence is only the third baby to be born to a serving prime minister since 1849. 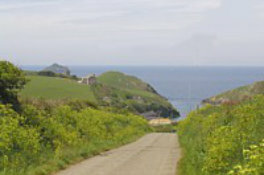 Looking for accommodation at Port Quin in North Cornwall Click Here If you have a business , service or facility / amenity that is in the boundaries of North Cornwall and you would like to appear in our listings then please click here. 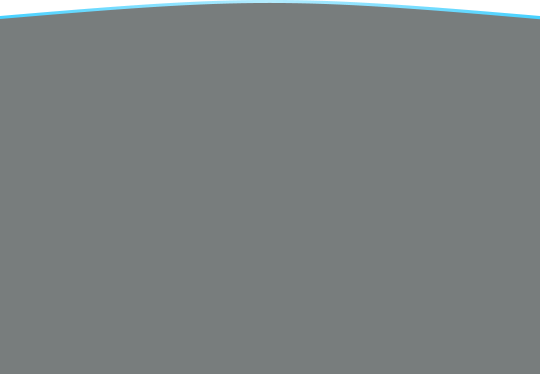 For further information regards this website visit us at Kestrel Solutions Copyright © 1998-2015 Kestrel Promotions All Rights Reserved. Use of this Web site constitutes acceptance of the Kestrel User Agreement. 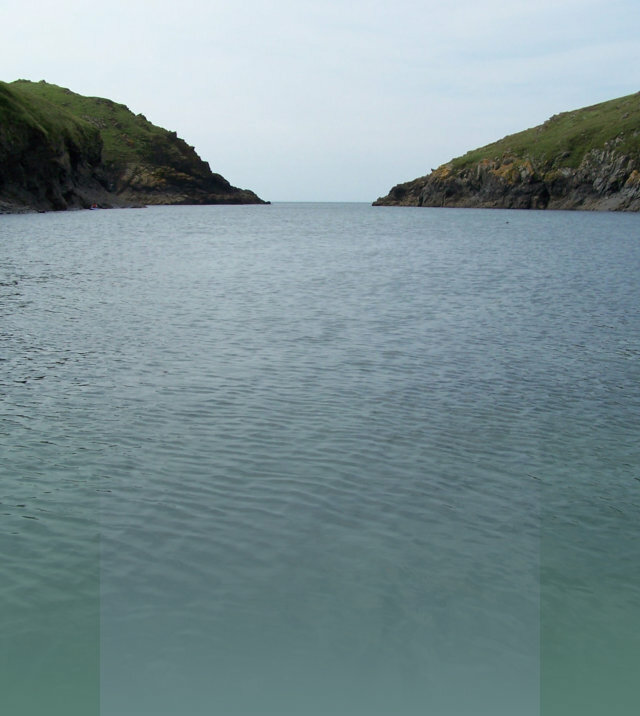 This beautiful natural harbour is situated just a couple of miles south of the busy harbour village of Port Isaac and offers safe bathing waters on calm days. The odd boat chugs in and out now and again, for a nose, but other than that the place is a tranquil cove that conjures up images from the past. There are stunning cliff walks and plenty of nooks and crannies on the beach to poke around in when the tide is low. To find Port Quin just head on past the turning for Port Isaac as if you where going to Polzeath, and look for the tower of the church at St Endellion. This tower was used as a navigation aid to ships in days gone by, but now guides sightseers towards one of the most dramatic stretches of coastline in the whole of England. Just before you reach the Church at St Endellion, you will find a narrow country lane leading down to the Longcross Victorian Gardens, here the turning for Port Quin is clearly signposted. There is a definite feeling of days gone by as you travel down this lane, following the twists around tight little bends that take you ever nearer the sea. Port Quin was abandoned on two occasions, once when the pilchards failed and once when all the men were drowned at sea, and is still sometimes referred to has the "Village that died", because late one stormy night, sometime in the19th century, the entire male population were drowned at sea whilst out fishing. The women of the village were unable to continue without their men folk, their hardship became intolerable and Port Quin was left deserted, with the fishermen's cottages falling into disrepair, ruin and the sea. You can still see the fish cellars there today. But the Port is now mainly a tourist spot with a scattering of National Trust properties and a couple of private dwellings. It is also rumoured that Viking longboats came ashore here and apparently, the remains of one that was buried, are here about. The headland on the south side of Port Quin is known as Doyden Point whereon you will find Doyden Castle, which was built in 1830 as a retreat for some local businessman, where, it is reputed the partying and gambling were quite excessive! Now it is a National Trust holiday property has is nearby Doyden House. Has recently has 12/06/05 25–30 Common dolphins were spotted off Port Quin Bay. A sign that the water is getting warmer is the appearance of the rare pink sea fan which has been recorded at the Mouls off Port Quin, which is a new, previously unrecorded site. Port Quin has been a location for the TV series Poldark (1975-77). Based on Winston Grahams Four Poldark novels, this C18th Cornish Romantic drama followed the life of Ross Poldark. 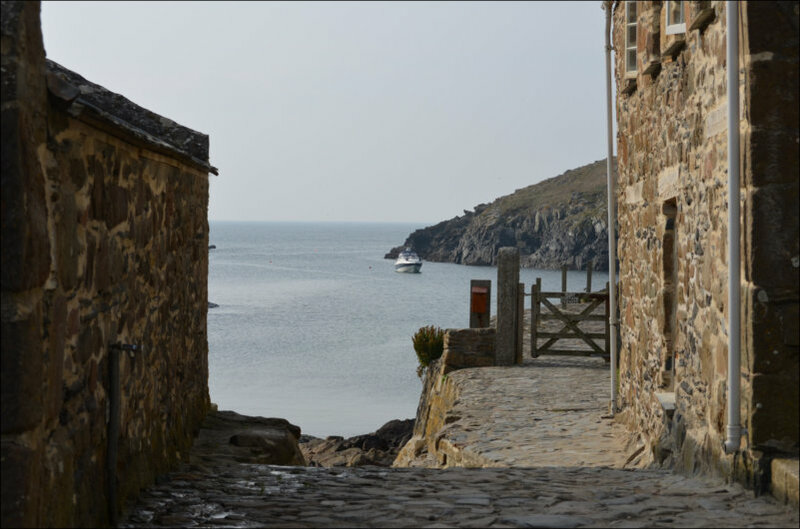 More recently Amy Foster (1996)used Port Quin as a location. 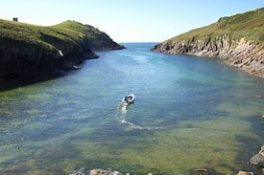 Port Quin is also one of the places that inspired Marcia Willet during the writing of her book, "The Golden Cup". Sir John Betjemen also had a special affection for this neck of the woods..... "St.Endellion! St.Endellion! The name is like a ring of bells...", First and Last Loves (1952). His last resting place can be found at St Enodoc in the dunes of Daymer. The church at St Endellion is dedicated to St Endelienta and has many legends about the saint whom gave her name to this church and parish. 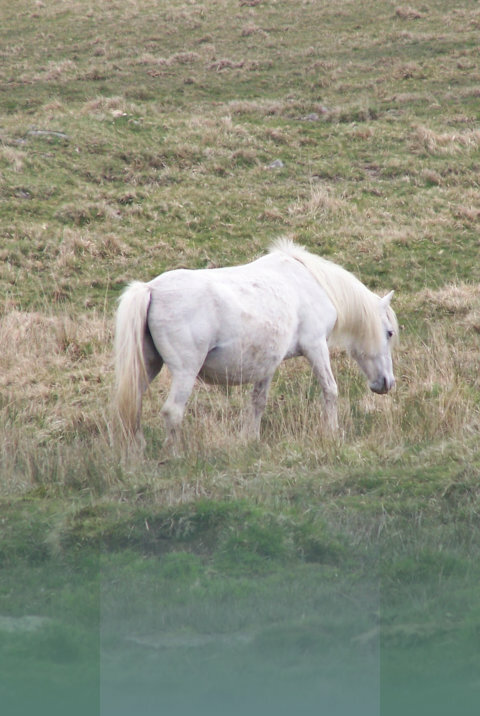 One suggests that she was the daughter of the Welsh King Broccan, another that she was the god-daughter of King Arthur, who helped her when a local lord killed her cow. It is the only church known to be dedicated to this saint. The parish is on the north coast of Cornwall south of Port Isaac. The high ground upon which the church stands renders its tower a conspicuous object at a considerable distance, and was a landmark from the sea. The organ for the Collegiate Church of St Endellion was made in 2001 and is based on early 18th century English organs, mainly the Father Smith organ at St Mary Finedon in Northamptonshire and the Gerard Smith organ at St Lawrence Whitchurch in Middlesex. If you look you will find St Endelienta's emblematic cow in the middle of the central pipe shade. The Long Cross at St Endellion or St Endellion Pillar was first mentioned in 1753 by a J Tregeare. In 1753 a James Tregeare collected notes for Borlase...He referred to a cross standing on the boundary of Roscarrock Barton, between Roscarrock and St. Endellion Church `with a barbarous inscription'...The stone was certainly recorded in 1821 as being at the junction of the roads above Roscarrock higher- town gate and thrown down and broken within these few years'. In 1873 Maclean recorded that the stone had been `removed by the late Mr. Symons of Gonvena to Doydon Head near Port Quin, on the western side of the creek'...The stone remained on Doydon Head until `the end of 1932', when it was replaced in its original position, where it still is'. The stone is a cross- marked pillar-stone, made from local granite, that appears un-carved, although a cross in relief has been noted on the back of the stone. There is a national trust car park at Port Quin and Kayaking and Cliff Jumping are popular sports that are practised from this cove. On the 24th August 2010, David Cameron, the serving Prime Minister, was on holiday in North Cornwall when his wife, Samantha, went into labour at Truro's Royal Cornwall Hospital and gave birth to a healthy baby girl that they chose to name Florence Rose Endellion Cameron. The Cameron's' new baby Florence is only the third baby to be born to a serving prime minister since 1849.